Paris is nirvana for lovers of art and architecture. It seems like every new street corner unveils another marvel, some totally unexpected. This is one of the true joys of visiting the City of Light—suddenly stumbling upon a beautiful old building, statue, park or street art that warms the heart and sparks the spirit. 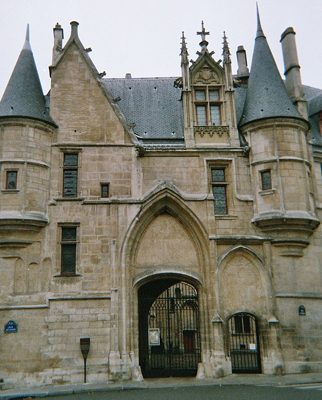 One of the best of these surprises is when wandering the streets of the Marais near the Seine and suddenly catching a glimpse of the gorgeous stone mansion Hotel de Sens—what can only be described as a stately medieval castle, complete with turrets, spires and grand stone arches. And it is accurate to depict the Hotel de Sens as medieval, as its construction as a private mansion began in 1475, the tail end of the Middle Ages. In fact, the Hotel de Sens is one of only three medieval residences remaining in all of Paris. She departed after about eight months to establish a household on the Left Bank, the Hostel de la Reyne Margueritte. 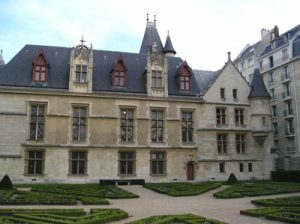 The Hotel de Sens last served as a residence for the archbishop of Sens in 1622, and afterward was used occasionally to host lesser members of the royal family and members of the king’s court. 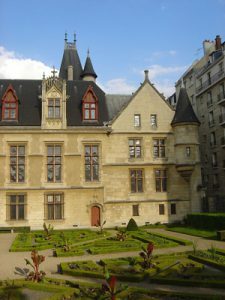 Like many royal residences in and around Paris, the Hotel de Sens was confiscated during the French Revolution and began a long chapter of misuse and neglect, including serving as a warehouse, a laundry, a canning factory and the Saint James jam factory in the late 1800s. 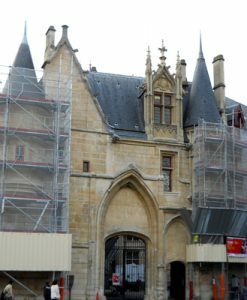 The City of Paris bought the building in 1911 and embarked on a major restoration project followed by a second renovation in 1936. Sadly, most of the structure today has been restored with more modern materials. The only original medieval feature aside from the building’s foundation is a large fireplace in one of the mansion’s main halls. In the early 2010s, the castle was once again cleaned and renovated. Since 1929, the building has served as the official home to the Bibliotheque Forney, a library specializing in decorative arts named after the industrialist Samuel Forney-Aime who made it a personal mission to educate artisans, draftsmen, bronze workers and cabinet makers. 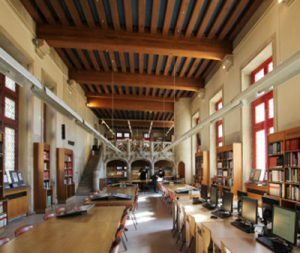 The library was created in 1886 in the Faubourg Saint-Antoine district to allow these artisans to borrow books and models to help advance their crafts. Although the library was relocated to the Hotel de Sens in the late 1920s, the actual transfer of the library’s collection didn’t take place until 1961. Today, the library’s collection includes 230,000 prints and technical manuals, 4,000 periodicals, 30,000 advertising posters dating back to 1880, 9,000 samples of wallpaper, 400 fabric samples and more than 7,000 original drawings of furniture and other decorative pieces. 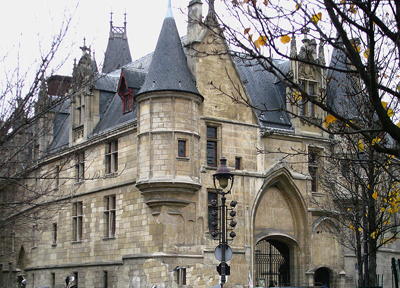 It also is home to many foreign books on fashion, costume design, graphic arts, engraving and the history of printing. The Bibliotheque Forney’s full collection is accessible only to registered members, but the library does host several exhibitions each year that are free and open to the public. Unfortunately, the exhibition space is the only part of the castle’s interior that is reachablewithout a library membership. For more information on current and upcoming exhibitions, go online to http://www.offi.fr. However, the Hotel de Sens grounds and manicured garden are availableto all during the library’s opening hours, 1-7:30 p.m. Monday-Saturday (with a 10 a.m. opening on Wednesday and Thursday). 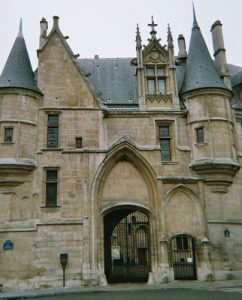 This entry was posted in Architecture, Beauty of Paris, French history, Hidden Paris, Marais, Right Bank, Sight-seeing and tagged Bibliotheque Forney, Hotel de Sens by Bob Adams. Bookmark the permalink.